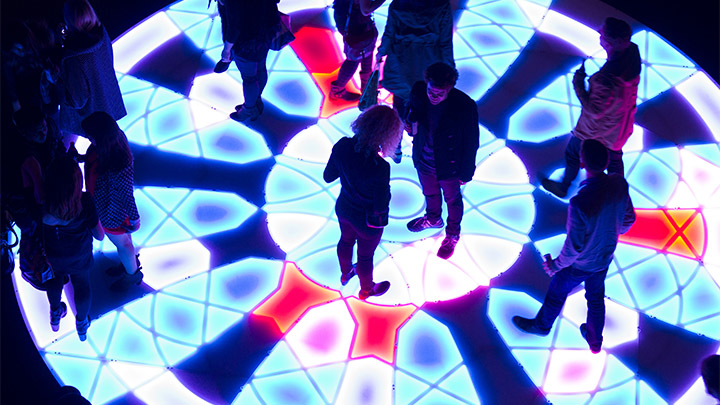 Interactive dance floor with 265 LEDs #ArtTuesday « Adafruit Industries – Makers, hackers, artists, designers and engineers! Art practice eness built this incredibly cool LED dance floor featuring 265 LEDs. Dance like Billie Jean on this new MINI interactive dance floor. A collaboration with Vice Australia to launch the car along the east coast. This floor pays homage to the 2014 MINI LED dashboard, and if you look closely the spiral-graphic design is all formed out of a single MINI Logo. There are 265 unique addressable LED tiles that burst in colour to your moves and the music.